Download the Special for the price of your choosing here! With the marathon only one week away, the Gomers are feeling reflective. And nervous. 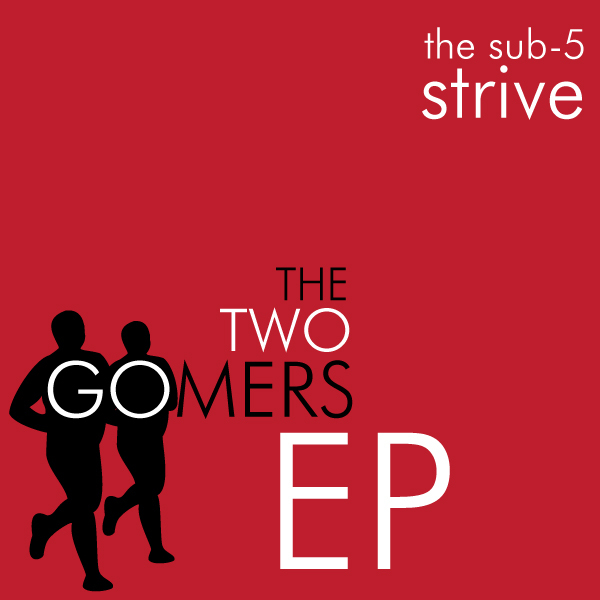 So it’s the perfect time to release their second special for Season 3 – Two Gomers’ Life Lessons! Join them as they talk big picture – What have they learned the past three years they wouldn’t have learned if they’d never made the choice to live a different life? Oh, the intrigue! Plus, this special is the obvious winner of the coveted Overused Metaphor in a Single Episode Award. 1. Anyone who pays $2.99 or over is entered into a drawing for a free tech or t-shirt. 2. If you pay $13.1, you’re ALSO entered into a drawing for a hoodie. AND you’re entered into a drawing to become Gomer8. 3. If you dig deep and pay $26.2, you are entered into drawings for all that stuff, PLUS you get a link to download The Two Gomers EP. Thanks for donating, and Happy Running! Our journey with you has turned in to far more than 26.2 miles of pavement. We experience the “sole” part of the journey on a regular basis. This special episode ( and the one with the baby announcement) takes us into the heart and “soul” of the gomers. I hope the gomernation can help take you wherever you guys want to go. You have earned our support. Tonight the TV will be off in our home and my husband and I will be listening to this special episode together. It IS that good. Thank you.